In case you missed it, Heights Park is now on Instagram! Follow @HeightsPark for regular photos and videos of the people, animals and activities that make Heights Park the best community in Richardson. 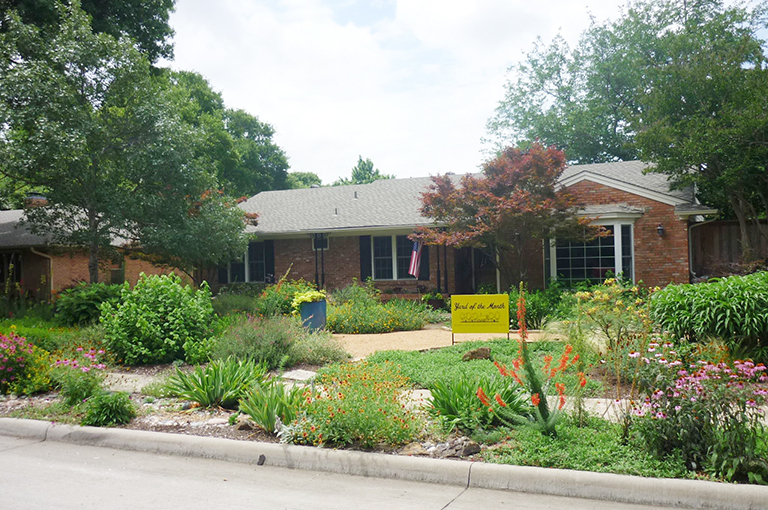 “We are extremely honored to be chosen as Yard Of The Month for June by the Heights Park Neighborhood Association. “We have lived in our house for almost 16 years. Our yard has evolved over time. What started as a lawn of grass and a few boxwoods has become our own little arboretum. The design and concept was my own creation. My husband thought I was crazy when I told him I was going to remove all the grass from the front yard.  It has taken a few years to slowly accomplish this. “My goal was to create a xeriscape that would be beneficial to the wildlife and preserve our natural resources. We are an extremely Earth friendly family. We maintain a fully Organic garden. No pesticides or chemicals are used. We have planted host plants as well as nectar plants to promote our butterfly population. The monarchs are amazing when they are in flight. I maintain two bee hives that pollinate our yard and neighborhood. We have focused on planting Texas native plants. We relying mostly on our five rain barrels, instead of city water. Some of the many benefits of planting Texas natives is they are drought tolerant and will survive our hot summers. They will reseed and propagate each year as well.